We hope the information on this site will answer any questions and concerns you might have, but do not hesitate to ask any member of our staff about matters that concerns you. The management staff of Surgisite Boston has assembled a team of skilled professionals, proficient in the latest medical technology and committed to delivering the finest level of service. 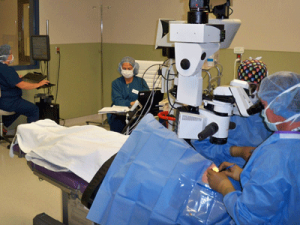 In our state-of-the-art operating rooms, we use specialized, sophisticated equipment that exceeds the standards and requirements found in most hospitals in our area.We also have the most advanced technology in ophthalmic lasers. Additionally, our operating suites incorporate sterile supply and pharmacy storage areas as well as patient changing rooms. Patients are treated and return home the same day. Our modern facility provides a relaxed atmosphere for both patients and their families, with a typical stay for cataract surgery requiring approximately 2 – 3 hours.